Atletico Madrid extend their unbeaten start in La Liga as Kevin Gameiro scored his first goal of the season to beat Celta Vigo. The France striker hooked home from close range after the hosts failed to clear Saul's corner. 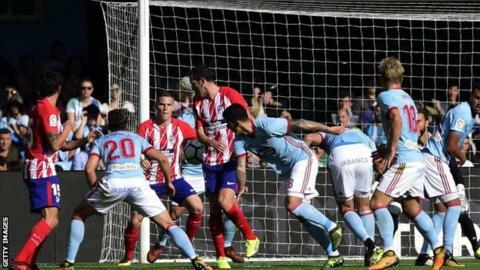 Celta were unlucky not to score, Iago Aspas hitting the bar with a free-kick and John Guidetti forcing a last-minute Jan Oblak save with a backheel. Atletico briefly moved to third, before Real Madrid's 3-0 win over Eibar. Leganes are fifth after beating Athletic Bilbao 1-0, with Claudio Beauvue scoring the goal. Sixth-placed Villarreal beat Las Palmas 4-0. Cedric Bakambu, Mario Gaspar, Ximo Navarro - into his own net - and Nicola Sansone were the goalscorers. Match ends, Celta de Vigo 0, Atlético de Madrid 1. Second Half ends, Celta de Vigo 0, Atlético de Madrid 1. Corner, Celta de Vigo. Conceded by Stefan Savic. Sergi Gómez (Celta de Vigo) wins a free kick in the defensive half. Attempt saved. John Guidetti (Celta de Vigo) right footed shot from the centre of the box is saved in the bottom right corner. Assisted by Sergi Gómez. Attempt blocked. Sergi Gómez (Celta de Vigo) right footed shot from the centre of the box is blocked. Corner, Celta de Vigo. Conceded by Thomas Partey. Attempt missed. Antoine Griezmann (Atlético de Madrid) left footed shot from outside the box is high and wide to the left. Assisted by Filipe Luis. Emre Mor (Celta de Vigo) wins a free kick on the left wing. Attempt saved. Hugo Mallo (Celta de Vigo) left footed shot from outside the box is saved in the centre of the goal. Assisted by Iago Aspas. Substitution, Atlético de Madrid. Filipe Luis replaces Ángel Correa. Attempt missed. Maxi Gómez (Celta de Vigo) header from the centre of the box is just a bit too high. Assisted by Emre Mor with a cross. Attempt blocked. Stanislav Lobotka (Celta de Vigo) right footed shot from outside the box is blocked. Delay in match Lucas Hernández (Atlético de Madrid) because of an injury. Pablo Hernández (Celta de Vigo) is shown the yellow card. Attempt missed. John Guidetti (Celta de Vigo) left footed shot from the left side of the box is close, but misses to the left. Assisted by Emre Mor. Offside, Celta de Vigo. Emre Mor tries a through ball, but Pione Sisto is caught offside. Attempt blocked. Maxi Gómez (Celta de Vigo) right footed shot from the centre of the box is blocked. Assisted by Pione Sisto. Offside, Atlético de Madrid. Saúl Ñíguez tries a through ball, but Juanfran is caught offside. Corner, Atlético de Madrid. Conceded by Pione Sisto. Nicolás Gaitán (Atlético de Madrid) wins a free kick on the left wing. Attempt missed. Antoine Griezmann (Atlético de Madrid) header from the centre of the box is close, but misses the top left corner. Assisted by Saúl Ñíguez with a cross. Substitution, Celta de Vigo. Emre Mor replaces Gustavo Cabral. Substitution, Celta de Vigo. John Guidetti replaces Daniel Wass.